Launched in 2004, UEvent was created to help churches and non-profits migrate their paper registrations online. Since UEvent’s inception, we’ve helped hundreds of organizations grow their event attendance while eliminating up to 80% of the administrative time. UEvent was designed to handle nearly any type of event, from the smallest monthly meeting to large conference registrations with thousands of attendees. Are you curious about our system? Try it out! It is free to create an account, and fees are only applied when you collect money for your event. We welcome questions and are always glad to assist in personalizing your event. If you call during business hours, you will always talk to a trained professional who is ready and willing to learn about your organization, your needs and the registrants you are trying to reach. 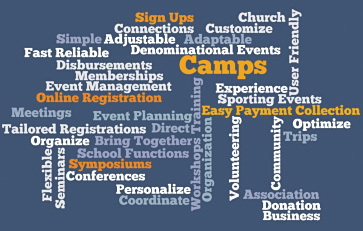 · Enhance value and increase the number of registrants for each event. · Increase brand reach for organizations, businesses, and churches. · Collect registrations and payment before the event starts. · Provide customizable reports so you get the information you need, when you need it. UEvent collaborates with clients who want to build a sense of community by spending time together in groups or at events. Let's accomplish this together for your business, organization, or church!